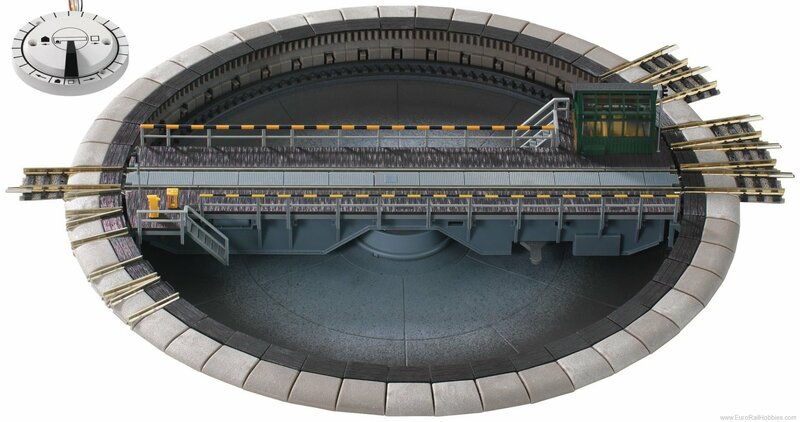 The turntable is sunk into the ground, exactly like the real thing and is complete with all the correct detailling. The basic turntable has 6 exit tracks and 4 stub tracks. The track exits are set at 7,5Â° intervals, but can be altered if desired, or extended with the extension set 9153 up to total of 48 track exits. The thinking turntable: The turntable movement is controlled by using the switch 6910, in order to reach the desired track exit. The track power feed is via the turntable bridge. Now the switch 6910 will enable the desired track exit, which is lined up with the turntable, to be electrically switched on. All the other track exits (even one directly opposite) will remain without power. In this way, each of the maximum of 48 track exits can be individually controlled and electrically switched on, without the need for any additional wiring.